Thank you to everyone who came out to the PTCA Fall Festival: Battle of the Bands Edition on Saturday. The weather could not have been more perfect, and a good time was had by all! The PTCA is grateful for the efforts of the Fall Fest Committee led by Amanda Evans and Dara Dearborn, the event sponsors, the volunteers and all of the attendees. Battle of the Bands Edition – Questionable @ Best! Scarecrow competition – First place: Scaredy Katz from the Katz Family (K), Honorable mention: Pumpkin Head the Gatewood Family! The Fall Fest could not have happened without the support of our annual sponsors. 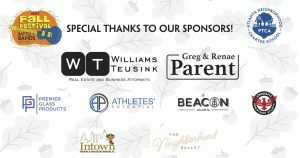 These donors provide year-round financial support and we are so grateful for their commitment to ANCS: Williams Teusink, LLC | Greg & Renae Parent | Premier Glass Products | Athletes’ Potential | The Beacon Atlanta | CrossFit Downtown Atlanta | Intown Pediatrics | The Neighborhood Ballet.